March 25, 2018. 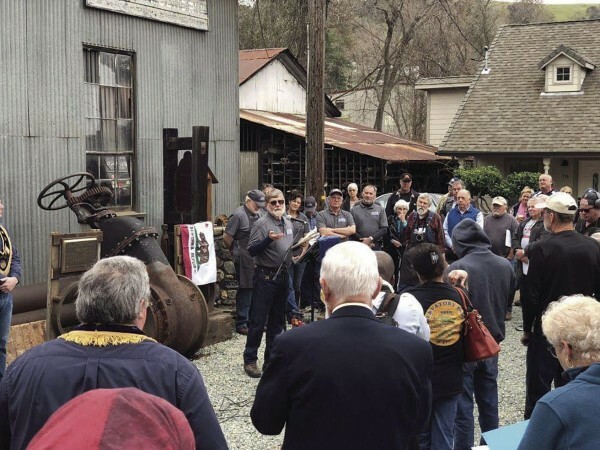 The American Society of Mechanical Engineers (ASME) and the Native Sons of the Golden West (NSGW) held joint programs with plaque dedications to honor and commemorate Knight Foundry recently. Ed Arata acted as the MC for the program and began by welcoming all of those in attendance and by thanking the Sutter Creek City Council; Mayor, Linda Rianda, Josie Cadieux-Faillers, Robin Peters, Jim Swift and Tim Murphy, and Amy Gedney, City Manager for their efforts to purchase the Foundry site in 2017, and their ongoing support for the rehabilitation and development of the site. Arata also thanked the current Knight Foundry Alliance board members – Robin Peters, Josie Cadieux-Faillers, Frank Cunha, Ron Edgar, Joe Harralson and Carma Zisman for the fundraising activities and program development. Finally, he thanked all of the volunteers who are working at the site under the direction of Ron Edgar and Joe Harralson.